Last year, I shared about writing latex in Blogger using Watchmath. Sadly, the server has been offline for a very long time. I have also shared about a Free Online Latex generator at Codecogs.com, a good alternative. 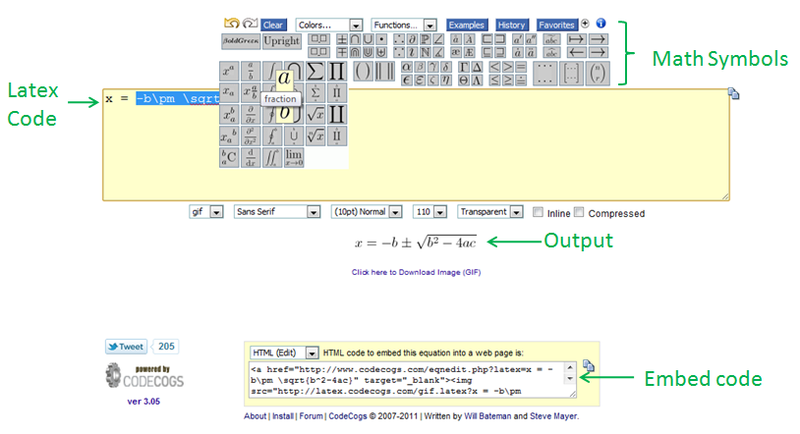 Codecogs.com has a WYSIWYG environment. You just have to choose the math symbol and it will automatically generate the Latex code. To embed the code in Blogger, just copy the HTML code to your post (be sure that you paste in the HTML window). Aside from embedding code in HTML, Codecogs.com also provides embed code s for XML, phpBB, Tiddlywiki, and WordPress.